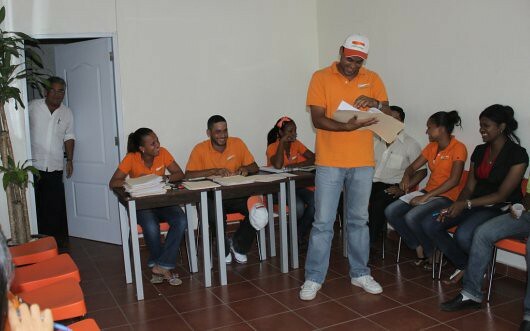 Microfinance credit committees reviewing applications for loans in the Dominican Republic. Photo by Sebastiao Ferreira. Last week, I was in Santo Domingo working with Credito Amigo (CA), a microfinance pilot project oriented to serve the bottom of the social pyramid. Its aim is to provide financial services, mainly credit, to the one million Dominican micro-entrepreneurs who currently have no access to the mainstream financial system. The financial group, BHD started Credito Amigo as a pilot project in 2009. One year later, Credito Amigo has 5,000 clients and plans to triple this number by the end of 2011. Credito Amigo serves very small-scale entrepreneurs, delivering credits between $100 and $500, to be paid weekly in two to four months. At that scale, businesses have no written accounting systems, no fixed assets, and no capacity of providing collateral. Thus, Credito Amigo uses a group methodology where participants guarantee each other repayment and CA credit-analysts have to assess the real situation of those very small economic unities and also uncover the operating style of the business owners. I enjoyed the experience of participating in a session of the Credit Committee, where the members present and discuss credit applications, and ultimately decide to approve them or not. Each case was an example of the deployment of the collective intelligence of the very young credit-analysts, predominantly women. These analysts shared their experiences with relevant cases and asked insightful questions. Despite their young age, the credit-analysts are doing very well. The quality of their portfolio is excellent, less than four percent of portfolio at risk, and getting better every day. Pancho Otero, a pioneer of microfinance in Latin America, who created Banco Sol in Bolivia in the late 1980s, is leading the project. Banco Sol was the first microfinance bank in Latin America and a main driver of microfinance in the continent. Now that most microfinance institutions are moving up through the social scale, looking for bigger clients, Pancho is refining his methods to provide financial services to the poorest layer of entrepreneurs. Together, Pancho and I are working to institutionalize and share the learning and knowledge of the credit-analysts, so they can develop professionally and become the future managers of this emerging organization. We are treating the credit committees as a kind of community of practice, a concept developed by Etienne Wenger (Wenger, 2010), where the credit-analysts can share what they have learned from their clients and from their own experiences. If the project keeps moving on the current trajectory, in a couple of years, 25,000 to 35,000 Dominican micro-entrepreneurs will have access to credit, savings, and probably micro-insurance. Hundreds of young professionals will be proud that they were able to build a new future for themselves, and a new actor of the Dominican financial system will be challenging the business models of its peers. Wenger, E. (2010). Communities of practice: A few frequently asked questions. Electronic version directly sent by the author. Sebastiao Ferreira is a Brazilian who lived in Peru most of his life. He is a Visiting Scholar at the CoLab and his work involves development of cognitive methods for community-based knowledge capture and creation, as well as development of mechanisms for detecting and promoting innovative initiatives in communities.